The word of the week is OWN. When we take ownership of something, how does it affect our relationship with it? It usually causes us to have more of a connection to it, or even an admiration for it, don't you think? If you own a pet cat, think about your cat in relation to all the other cats in the world. You might say, "That cat is nice" about any cat in the world. But, for your own cat, you would say, "This is MY cat. He is special." Think about your car, your house, your child, your friends, and so on.You might say, "Look at all the nice cars in the lot." But, when someone asks which car is yours, you could say, "Here is MY car." The same would be true for anything else you own. What about God? Do you feel as if God is an impersonal God who doesn't really care about you? Is He just someone who is "out there," someone who created the world but doesn't really have anything to do with you? If that is what you think, then you haven't made Him YOURS. Take a look at how many times King David uses the word MY in Psalm 18:1-3 when referring to the Lord, HIS God. Psalm 18:1-3 - “I love You, O Lord, my strength.” The Lord is my rock and my fortress and my deliverer, my God, my rock, in whom I take refuge; my shield and the horn of my salvation, my stronghold. I call upon the Lord, who is worthy to be praised, And I am saved from my enemies. In these verses, God was a personal God to David, meaning He was working for him and helping him through life. He wasn't just "out there" and letting David fend for himself. David understood that. Since the creation of the world, God has made Himself known. You just have to open your eyes, and your hearts, to see it. How do you seek Him? Get to know Him better by studying His Word (the Holy Bible). The words in the pages of the Bible are God's personal letter to you. Find out what He has to say. Talk to Him as if He is in the same room as you and not just up there somewhere in the clouds. Prayer is your very own personal connection to a God who hears you and understands your needs. When you seek God in this manner, you WILL find Him, and you WILL be drawing near to Him. You will be making Him your own. 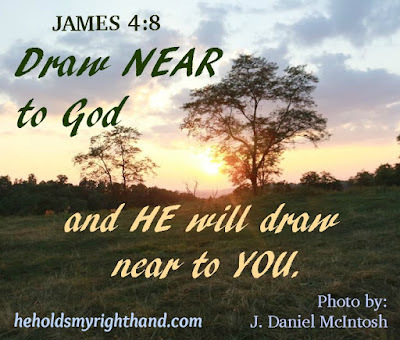 Draw near to Him today, and He will draw near to you. You have always had a way to say things that help spiritually. Thanks for your encouragement! My desire is to use my writing to serve the Lord. If it helps/encourages just one person, then it is worth it.